Brand evangelists. Creators. Integrators. Planners. Wordsmiths. Designers. Thinkers. Doers. We come from diverse backgrounds, but we share a common passion: Providence College. That passion drives our work, sparks our creative process, and fuels our desire to let the world know just how great this place is. We are responsible for Editorial Services, Creative Services, and Marketing. We develop and communicate the College brand through high-quality messaging. We foster integrated College communications. 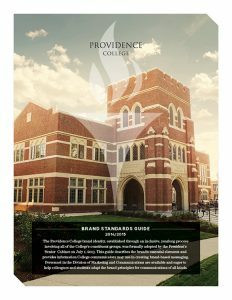 We collaborate with Providence College partners to inform and inspire constituents who can help the College achieve its strategic goals. It’s our job to efficiently, effectively tell the PC story.